Companions Saturnian Chapter No 7563 were extremely honoured by the presence of the Deputy Grand Superintendent Paul Renton at their installation convocation at Cleveleys Masonic Hall. Pictured from left to right, are: Paul Renton, Steve Willingham, Derek Broadbent, Gordon Major. Paul was accompanied by Assistant to the Provincial Grand Principals Duncan Smith, North Fylde Group Chairman Peter Greathead, David Randerson, Brian Parkin, Stuart Thornber, Norman Thomas, John Cross, Roger Perry and Martyn Jones. The three principals elect were then presented by director of ceremonies Norman Thomas to mark the start of the installation proceedings. Derek Broadbent being installed as first principal, Steve Willingham as second principal and Gordon Major as the chapter’s third. Each principal in turn recited their obligations with the greatest of skill. The installing officers were Brian Parkin and Peter Bracegirdle. Norman Thomas delivered the address to the three principal in a style befitting the ceremony. On completing the installation of their officers for the ensuing year Paul Renton rose to give the all-important address to the companions of the chapter. Paul Renton (left) receives flowers for his wife. Following a sincere ceremony, Paul, on behalf of the Grand Superintendent Tony Harrison, congratulated the three principals on being installed in the chairs of the chapter and wished them good health and happiness for an enjoyable year in office. He went on to congratulate Damien as installing first principal and Norman Thomas as DC for his work during the ceremony. Derek Broadbent presented cheques to Paul for the amounts of; £150 for the 2021 Masonic Charitable Foundation and £100 for Prostate Cancer. Paul thanked the companions of Saturnian Chapter on behalf of the ultimate recipients for raising such a magnificent amount. Following the installation, the companions retired to the Park Suite for a sumptuous festive board made by hall caterer Jane Peters (who is soon to retire after 20 years of service to the hall) and her staff. Paul Renton, in response to the toast to the grand officers, said that in his travels it was great to see the different variations of ritual. He thanked scribe Ezra Michael Dickinson for his help in providing the background information that made his visit to the chapter a pleasant one. Paul praised Peter Greathead and the group officers for their hard work and commitment. 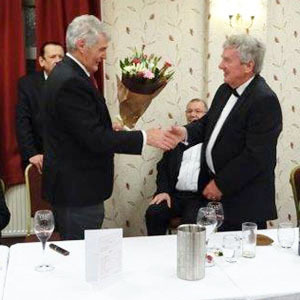 Paul thanked Norman Thomas for stepping in as Deputy Provincial Grand Director of Ceremonies. Paul moved on to recruitment and retention saying that it was particularly important that new members to the chapter were looked after and included in performing ritual whenever possible. 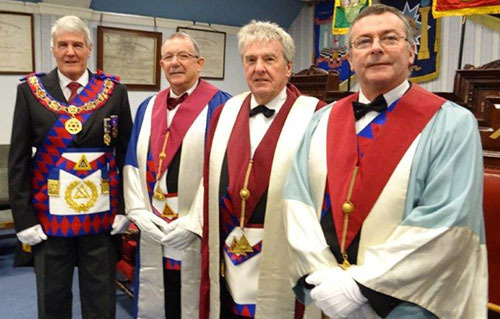 He added that newer companions needed assistance to understand the Royal Arch and to this end the United Grand Lodge of England have launched a new scheme called ‘Solomon’ to help members learn and understand ritual. To complete a fantastic evening, the raffle raised £153 which was to be donated to the 2021 Masonic Charitable Foundation. Gordon Ivette closed the evening by proposing the janitor’s toast. Pictured from left to right, are: Peter Greathead, Brian Parkin, Stuart Thornber, Paul Renton, Steve Willingham, Derek Broadbent, Gordon Major, Duncan Smith, David Randerson, Roger Perry, John Cross, Norman Thomas and Martyn Jones.